Das, P., Pareek, A., Singla-Pareek, S. L. (2015). OsHBP1b mediated increased photosynthesis and intact chloroplast structure, revealed to be associated with higher grain yield in rice under salinity stress. To be communicated in Plant Molecular Biology. Lakra, N., Nutan, K. K., Das, P., Anwar, K., Singla-Pareek, S. L. and Pareek, A. (2015). A nuclear-localized histone-gene binding protein from rice (OsHBP1b) functions in salinity and drought stress tolerance by maintaining chlorophyll content and improving the antioxidant machinery. J Plant Physiol 176: 36-46. Ray, M., Mishra, P., Das, P. And Surendra, C. S. (2012). Purification and expression of Rice catA in E. Coli cytoplasmic fration. J Biotechnol 157:12-19. Das, p., Naveen, C. J. (2011). Minor modifications in obtainable Arabidopsis floral dip method enhances transformation efficiency and production of homozygous transgenic lines harboring a single copy of transgene. Advances in Bioscience and Biotechnology 2:59-67. Sahu, S., Das, P., Ray, M. and Sabat, S. C. (2010). Osmolyte modulated enhanced rice leaf catalase activity under salt-stress. Advances in Bioscience and Biotechnology 1: 39-46. Das, P., Manoranjan, K. and Sahoo, S. (2010). In vitro hormone regulated growth and floral induction of Cuscuta reflexa -a parasitic angiosperm. 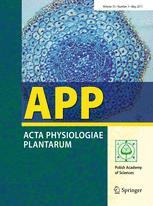 Acta Physiol Plant 33: 1031-1035.